"Their path took them through a stretch of primeval forest new to Adam. As with most of Willam’s trails, it followed a skipping run, pure and innocent as a child’s laugh. The little brook gurgled and darted like a mischievous sprite among the boles of lordly hemlocks. It tugged on mossy beards of cranky root, tickled toes of scowling boulders, played tag with ghostly crumbling skeletons of the forest’s severest fallen monarchs; then it dashed away and hid under mounds of leaf and litter, only to spring forth and join the teasing game again." Vaught Branch starts here - spilling vigorously out of the ground literally right on the AT at 3500 foot elevation with its pure cool goodness. And down it tumbles, with all the energy that a thousand foot of elevation change can provide. The AT crosses it seven times, one of which is right beside the Chatfield Memorial Shelter, shown above. In more than 500 miles of the AT that I've hiked, this is the shelter with the most delightful ambience - nestled among Rhododendrons and within sight and sound of the cascading stream. It's where I want to live! On the way I passed plenty of varied and interesting terrain in a convoluted 2.7 miles of AT hiking that takes only a mile by the (not straight) road. Then there's the spooky 'Enchanted Forest' along the ridge of Glade Mountain. This photo almost grosses me out. I call it "Say 'ahhh'". It's a cherry tree that has somehow sent a root *into* the gaping maw of an adjacent tree. How this could have happened escapes me. Then there's this example of a bewitched tree - just one of many, many distorted, contorted, tortured, and twisted specimens. 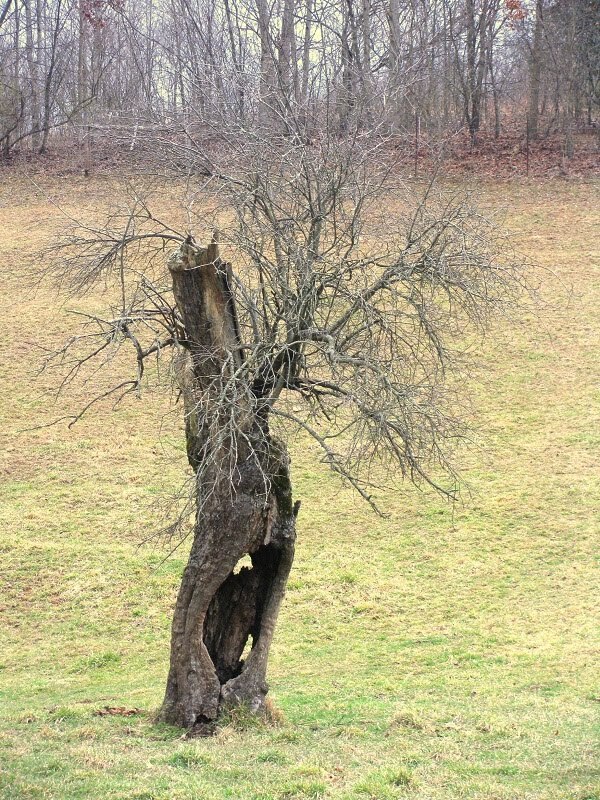 Apple trees are notorious for refusing to die even in the face of unspeakable torture. I've seen other examples over a lifetime of observing and admiring what trees manage to do. And finally, back to Glade Mountain - on the upper slopes, in the shadow of the Enchanted Forest, and right on the footpath of the AT, I found this ... this ... uh ... WHAT IS IT? 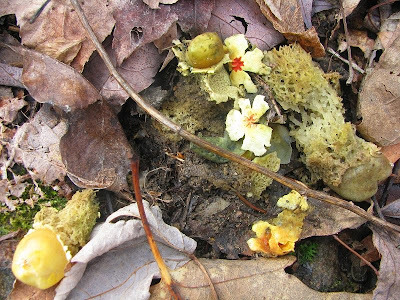 It appears to be a fungus or mushroom, ... which takes on the appearance of a flower. Does this fungus require some sort of 'pollination'? In all, a stupendously interesting day, and unseasonably mild as well - temperatures in the 60's all day. And it was another day of human isolation - no one else shared the trail with me. I saw some too in North Carolina. Sorry - still hoping somebody will know--a Google image search sometimes works for things like this if you enter the right key words, but so far I've come up empty.